What is the TouchPad Toolbox? The Touchpad Toolbox(TPToolbox) is an easy to use and reliable tool that replaces previous methods of installing Android onto the HP Touchpad. This excellent tool created by Jcsullins has dramatically simplified the installation of the latest Lollipop and Kitkat Data Media builds onto the Touchpad. The TP Toolbox can also install a few non data media roms, which will be listed in the guide below. In addition it gives users the ability to completely remove WebOS if desired. What is a data media build? Previously on the HP Touchpad Android and WebOS shared SDcard space in the media partition. This was the space you saw when transferring data via the USB cable. It stored all your media like music, pictures and movies. Data media builds separate the Android and WebOS space by emulating a 2nd ext4 SDcard in the data partition. The place where your app data was stored, separate from the SDcard media partition. With this setup the data partition now becomes the main place where your apps and users files(Music, pictures, movies, ect) are stored. The left over space in the media partition is now separate and only used by by TP Toolbox or WebOS. The media partition/volume will only be left with a small amount of free space and the majority will be given to the Android Data partition. If you keep WebOS the space will be around 1.17GB with V3.0.5 and lots of apps/preware, if you remove WebOS it will be around 600-800MB, so the total cost for WebOS is about 500-600MB. What are the Advantages and Changes for Data Media Builds? Data media builds change the default partition layout to more efficiently use the available space. You get a larger area for storing apps and mount an emulated ext4 SDcard on the Data partition. The ext4 doesn't suffer from the 4GB file size limit that the older Fat partition had and gives you more space for large apps. “Performance on ext4 in Android is also probably better than FAT.” The next advantage for HP TouchPad users is the updated 3.x Kernels all the new Android 4.4.x/5.x.x builds use. The updated Kernel's more efficiently communicates and allocates resources between the hardware and software. How can I go back to my old setup? Use the TPToolbox to do a complete data rest on your tablet. Install an android 4.2.2 roms, gaps, and recovery. Transfer your backup onto the touchpad, reboot into recovery and restore it. Note: You will need to make sure you have a compatible recovery installed to restore your backup. If you wish to go back to your previous setup you can run the ACMEUninstaller2 then install just CWM and moboot with the ACMEInstaller5. You can now Boot into recovery and restore your older backup. Note: That you can use Jcsullins and Philz Touch DM-CWM recoveries to restore your older nandroid backups. Data media recoveries can see both SDcards while restoring your backups. The Data partition will show up as SDcard and the Media Partition as SDcard1. How can I check my current Android version and System Partition size? -Get the free app,Quick System Info PRO, to check the size of your partitions and remaining free space. -Check your version of Android by going to settings/About Tablet/Android Version. A)You must have Java and the novacom software installed on your PC before running Jcsullins Touchpad Toolbox. Note: You may need to reboot after installing this software. Note: If you're having issues getting the Novacom drivers installed disable any antivirus or spyware protection that might be preventing the app from downloading the correct drivers for your system. B)Backup, Backup, Backup, Using the "Complete Data Reset" feature of the TPtoolbox or the "Erase USB drive" from WebOS, will delete absolutely everything on your HP TouchPad including the SDcard! So you will want to make sure you have your personal data files(music, pictures, videos, etc.) backed up on your computer. Don’t forget to move your Nandroid backups onto your PC. By default CWM backups are located in SDcard/clockworkmod/backup. NoteMake sure your tablet is fully charged before starting any install procedure on the HP TouchPad. Running out of batteries during an install procedure will ruin the process and possibly damage the device. Before running the Touchpad Toolbox you should decide whether or not you wish to completely remove WebOS. Even if you remove WebOS there will still be around 600-800MB of space left where it used to be on the media partition/volume. That extra space will only be used for the initial install of your roms via the TouchPad Toolbox. This space will not be accessible from some roms and will only be used by the TPToolbox or WebOS. So you must make a personal decision about WebOS’s usefulness to you. Would you rather have extra free space or a second OS that is unique but not well supported? On my 32GB Touchpad I have a maximum of 27.5GB available. With Android, WebOS(V3.0.5) lots of apps/preware and the free space required to use the TPToolbox(600MB+) it takes up around 1.17GB. If you remove WebOS the remaining media space will be around 600-800MB, so the total cost for WebOS is only about 500-600MB Click here. You will need to boot into WebOS to access its media SDcard space or use either the Jcsullins CM11 or Evervolv DM Kikat roms. Personally I like WebOS and think having a dual boot device is one of the unique and intriguing features of owning an HP TouchPad, the choice is yours. Note: Official WebOS support ends March, 15, 2015 see video below. A]Uninstall Android completely by using the ACMEUinstaller2, watch the instructional video below. After uninstalling Android you will automatically reboot to WebOS. 2)Next place this ACMEUninstaller2 file into the Novacom folder. -By default this folder will be located on your PC @ C:/Program Files/ Palm, Inc. Mac OS X users will find this folder @ /opt/nova/bin. -Download the ACMEUninstaller2 file and copy and paste it right into either of those directories. 3)Boot the tablet into WebOS recovery mode and attach it with the USB cable to your PC. Download and extract these ACME5 batch files and run the "removecm2.bat" file to uninstall Android. -If you currently have Android installed you can hold down the power button choose reboot and select "webOS recovery mode" from the moboot menu. Connect the HP Touchpad to your PC via the USB cable. -Reboot the HP Touchpad via WebOS rest options menu located @ launcher/settings/device info/reset options/restart. -Hold down the volume up button while the Touchpad reboots. Once you see the large USB symbol on the screen release the volume button. 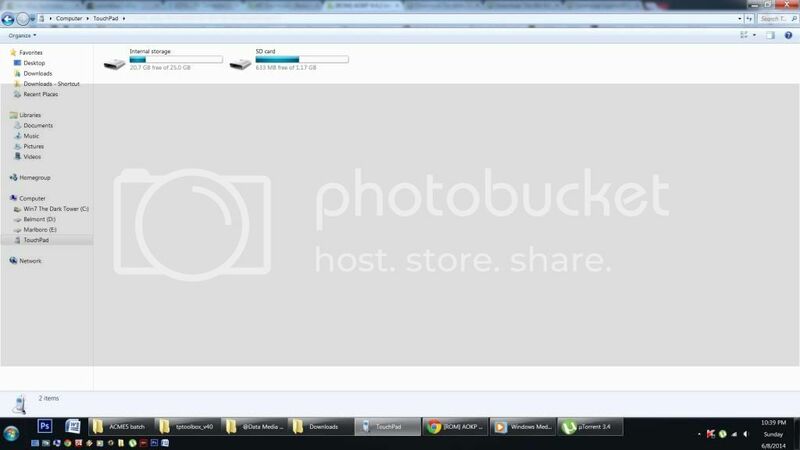 B]Now from WebOS we will wipe our SDcard before the TPtoolbox can setup our partition/volumes. Completely wipe your SDcard by booting into WebOS and going to, launcher/settings/device info/reset options/erase USB drive. The Touchpad will then reboot itself and the data will be completely erased. Note:This will not affect your WebOS setup, apps or Preware. Note: Even if you choose to remove WebOS, the WebOS recovery mode will still exist as it's part of the bootloader. If you currently have Android installed you can hold down the power button choose reboot and select "webOS recovery mode" from the moboot menu. Reboot the HP Touchpad via WebOS rest options menu located @ launcher/settings/device info/reset options/restart. Hold down the volume up button while the Touchpad reboots. Once you see the large USB symbol on the screen release the volume button. -The TPToolbox consists of 3 different panels, 1 menu, 2 help, and 3 output, see picture. -Use the volume button to navigate the menu and the home button to make selections. -The procedure will completely remove WebOS and Android from the device. The partitions/volumes will be rebuilt new and boot will be remade with a minimal amount of programs provided by the TPToolbox. -Scroll down to Complete Data Reset and select it with the home button and choose yes to begin the process. -If you previously did step number 3 then skip this step and proceed to step B. -scroll down to Install Android from the menu and select it with the home button. -The TP Toolbox will mount the media partition/volume to your PC. Open the Touchpads Media partition/volume and look for the “ttinstall” folder. Place the Rom, Recovery and Gapps zips into the “ttinstall” folder. -The Rom contains the Android operating system, the Gapps package contains all your Google apps and the Recovery allows for installation, restoration, and maintenance operations on your Android device. Note: Do Not unzip the files. -The TPtoolbox will now check the files for compatibility then begin to set your partitions/volumes based on the type of Rom you’ve selected. If it fails to run it will display which file is incompatible, start the install again and replace the offending file(s). -The output window will display the Pending Android Installation details; the partitions/volumes resize details that are about to be setup on your HP Touchpad. Review this information and confirm the layout by selecting yes. This starts the partitions/volumes resizing, followed by the Auto Android installation from your chosen recovery. Note: All HP Touchpad sizes are supported, 16GB, 32GB, 64GB. -The details of partition/volume resizing will scroll across the Toolboxes bottom output window(Bottom) and the device will auto reboot into your chosen recovery. The Rom and Gapps package will now be installed automatically, this may take a few muintes, Please stand by..... Once complete the Touchpad will restart and boot into Android. Be patient, it my take several minutes before the HP Touchpad completes it first boot into Android. Note(Important): If the TP Toolbox fails to run several times you may get an error message when trying to mount the volume during the install. To fix this rerun the complete data reset or wipe the USB drive from WebOS. After installing a data media rom you can do a clean install of another Rom listed in the guide by again using the TPtoolbox. Return to step 5 B) and install a different Rom. The TPtoolbox will wipe the system, data and cache partitions/volumes and do a clean install, WebOS will not be changed. Your apps and user data will be lost but your media content on the SDcard remains the same. If you wish to completely remove WebOS, Android and all data on the device return to step 5 A) and do a complete data reset. Note: When installing new roms the TPtoolbox will automatically prompt you to adjust smaller system partitions/volumes from older versions of the TPtoolbox(v40, v41x). For example a 700MB Kikat install will be increased to 800MB for Lollipop or a new Kitkat Rom install. Updating your current Rom with a newer build can be done using your recovery and will keep your current setup and apps. However, this can't be done from the TPtoolbox and will require learning about a few Rom flashing techniques from my instructional update guide below. -Select One of each, Rom, Gapps, and Recovery .zip files to download and install with the TPtoolbox(Do Not unzip the files). -Each Rom requires a corresponding Gapps package for its version of Android. 4.4.x Roms need 4.4.x Gapps, or 5.x.x. Roms need 5.x Gapps. -Each Rom has notes about its details and a rating for the battery drain during deep sleep. -Three recovery types are available to choose from; each does the same tasks but the interface is different, CWM, Philz CWM, TWRP. -For some Roms one of the recoveries may be recommended by the developers, always check their threads and read all notes. Which Rom should I choose? -Currently the Android 4.4.x Kitkat Roms are the most mature, stable and fully functional. I would recommend them as your daily driver. -Android 5.x.x Lollipop Roms are in developmental but aren't as fully functional as 4.4.x Roms. The battery life is shorter and more bugs have been reported. -Some Android 5.1.x Lollipop Roms and No Android 6.0.1 Roms may not be fully compatible with the current TPtoobox version42 and may need to be installed by flashing through recovery. -It takes several months after the initial release of a new android version for it to become mature and stable. Please see the developers threads for the latest details about their Roms, Happy Flashing. Rom Details: Low to medium battery drain (-5mA to -20mA), h/w video, Audio, Camera, Bluetooth, Inverted volume controls, Performance OC tab, Milaq Update app. Rom Details: Low to medium battery drain (-5mA to -20mA), h/w video, Audio, Camera, Bluetooth, Inverted volume controls, Performance OC tab. Rom Details: h/w video, Audio, Camera, Bluetooth, Inverted volume controls, PAC Console (OTA updates), PAC Performance settings (overclocking), Increased 2D & 3D GPU clocks up to 320Mhz, Increased default CPU clock from 1188Mhz-1512Mhz, overclocks up to 1782Mhz(3.4 Kernel), 1890Mhz(3.0 Kernel) Great for Gamers. Note:Using the lock screen may cause SOD(sleep-of-death), disable it by going to Settings->Security->Screen Security->screen lock=none. Note:Hold down power and home together if the screen is black(SOD) and you need to reboot. Note: Enable the developers tab by going to "About tablet" and clicking on the "Build number" 7 times. Rom Details: h/w video, Audio, Camera, Bluetooth. Legacy Non-Data Media Roms, Gapps and Recovery below: Warning do not mix Non-data media and data media files when using the TPToolbox. Note: If you accidentally mix the two file types you may need to run the "Complete data rest" or the "Erase USB drive" procedure again before you can install android. Rom Details: Low battery drain (-5mA to -10mA), h/w video, Audio, Inverted volume controls, Bluetooth, No Camera. Rom Details: Low battery drain(-4mA to -10mA), h/w video, Audio, Inverted volume controls, Pie Controls, Camera, Bluetooth. Rom Details: Low battery drain(-4mA to -10mA) h/w video, Audio, Camera, Bluetooth, Pie Controls, AOKP Rom Control, Hybrid Properties, Performance settings(OC), Custom Kernel Overclockable to 2157MHz, Increased 2D & 3D GPU clocks up to 320Mhz, Great for Gamers. HP Touchpad developer Jcsullins, has informed HP TouchPads users that there's a problem with our HP Touchpas A6 Firmware. This issue can cause an usually high battery drain during sleep. This problem occurs overtime while running both Android and WebOS. As a result the Touchpads battery drains more quickly with daily use and the overall life span is reduced. If your battery drain seems to be much higher on average, then flash the A6 Firmware to bring it back down. Users experiencing sudden drops in battery life should run this as well. Reflashing the A6 Firmware effectively fixes the problem but may need to be repeated as a part of regular HP TouchPad maintenance. I would recommend reflashing it ever few months to maintain good battery health. Watch this video and follow the step by step instructions to reflash your own Touchpads A6 Firmware. -Once installed open the app and go to history, click the heading at the top "%/h" to change it to "mA". -You can now monitor the history and compare it to the information in my rom guide. This allows you to interactively resize the Android (and media) volumes. This is not needed to "Install Android", but can be used at other times to 'tweak' the volume sizes as needed. If a fsck (file system check) determines that there are non-trivial errors on a filesystem, then this can be used to attempt to fix those errors. If you want to re-install webOS following a "Full Data Reset," you will need to run this prior to running webOS doctor. Android has been installed (without detriment to the Android install) may be provided in the future. Full instructions for reinstalling WebOS here. Only Touchpad Wifi supported (not 4G) at this time, use the instructions here to install the Evervolv 4G data media build. Support for non-KitKat/DataMedia installs very limited for now. Re-install of webOS after Android installed is not supported yet. Method for permanently installing TPToolbox (always available via moboot) not available yet. The main focus at this time is providing a reliable method to install KitKat/DataMedia ROMs. Additional/expanded legacy and/or other install types will be implemented after demand for such is determined. Note:The following are Solutions for the most Frequently asked questions and problems. -Go to Settings > Privacy > Privacy Guard > Advanced (3 dot menu) > Google Play services and disabled "Wake up" and "Keep awake". -Google Settings\Search & Now\Voice"Ok Google" Hotword detection\ Toggle the switch to off and see if that helps. Note: This can also help to reduce high battery drain during sleep. c)Turning off "network location services" might help to improve overall battery drain and longevity. -You may wish to monitor your battery drain history during sleep. -Note* See the Battery p/n # on the original packaging. You can also use Cool-Tools to monitor your battery drain in real time. -Watch the instructional video Here. 2)How to fix "Unfortunately Google Play Services Has Stopped"
-Rooted permission might be missing from your android 5.x.x rom, fix it by do doing the following. 2)Download and flash this Superuser .zip file here through recovery to get the permissions working. 4)If you're moving from Evervolv to CyanogenMod and your TP sees and tries to boot Evervol. - (Mpgrimm2) I have modified JcSullin's "Set CyanogenMod as Moboot Default zip to also delete the Evervolv ROM from /boot to prevent you from running out of space. Thanks to JcSullins and Flintman for the original zips and script templates. Flash the zip after a wipe/format and before flashing a CM rom zip. -Hold the home key while booting to force moboot to display the Menu. -This problem is often caused by using the CyBoot app in WebOS. 6)f the WiFi turns off in Sleep/suspend mode then uncheck wifi optimization. Note:Turning off "WiFi optimization" might help to improve WiFi functionality. 7)You can enable additional reboot options like recovery by enabling Developer options. -Go to Settings/About Tablet/ Tap on "Build number" 7 times. -A new menu will appear in the Settings/About Tablet/Developer options/ tab on the left. -Check "Advanced reboot" to get the Recovery/Boot loader options. 8)If Moboot is displaying multiple Rom or recovery names that you are not currently using, then do the following. -With a rooted File explorer go to root/boot/ and delete the unwanted uImage. ( X) file to remove the entry from Moboot. -Here you can also change the default boot option by editing the moboot.default as text. 9)If you installed Android and are unable to find the Play Store, you get keyboard errors or Android system errors , then you will need to reflash your gapps package. Click Here for the how to video! Note: If problems still persist then reflash the Rom and gapps to fix them. -Hold down the Power and Home buttons together for 30sec to force the TouchPad to Reboot. -Hold down the Power button and click the Home key 14 times. -Dirty flashing older builds (CM9/CM10) over newer builds (CM10.1/CM10.2) will result in Boot loops. -Doing an install with ACMEInstaller can sometimes result in a boot loop. Use a backup or flash the Rom and Gapps package through CWM or TWRP. -If your battery has been fully drained, then you may need to leave it charging for a full day. -When the battery is fully drained it can take the TouchPad a longtime to reach even the lowest battery level. -The USB cable does not transfer enough power to effectively charge the tablet. You must use the wall plug when charging the HP TouchPad. -After charging the HP TouchPad for a full day try holding down, home + power + volume down for 30+ seconds. Note* All debricking questions should be posted here! The Official Fix your TouchPad ( 8-12% stopped, No SD, Opps reformat, $&^#[email protected]&# crap) thread. Have a rom that's crashing or rebooting? Q: What’s the WebOS Doctor and when should I use it? The WebOS Doctor is a program that has two main functions for HP TouchPad users. It can either update your version of WebOS or fix problems with a damaged WebOS by completely reinstalling it. If WebOS no longer boots or apps and preware have stopped working correctly, then you will need to resinstall WebOS with the Doctor. A failed or interrupted attempt at changing the partition sizes with WebOS preware app Tailor may cause these problems. To check what version of WebOS is currently installed go to Launcher(Up Arrow)/Settings/Device Info/ Version. Note(Important): You MUST uninstall Android before running the WebOS doctor. Failing to remove Android before running the Doctor can result in the process becoming stuck at 8-12% and potentially bricking the device. If you are currently stuck visit the thread below for information about fixing the problem. If you’re unable to use the tablet at all follow the instructions in Jcsullins TPDebrick thread. Note(Click here): Running the Doctor will completely wipe all personal information, applications and preware from the TouchPad. Media like music and movies will not be affected. However I would recommend backing your important files to PC, before running the Doctor. Note(Important): In order to install apps from the WebOS store you will need to get the Root Certificate fix for WebOS cloud services. -Java must be installed in order for the TouchPad to communicate with your PC. 2) You MUST completely uninstall Android from the HP TouchPad before running the WebOS doctor. Remove Android by running the ACMEUinstaller2. Watch the following video for full uninstall instructions. 3) Download the latest 3.0.5 WebOS doctor application to your PC. If upgrading you can check your current version from WebOS by going to Launcher(Up Arrow)/Settings/Device Info/ Version. -In WebOS Reboot the device by going to Launcher(Up Arrow)/Settings/Device Info/ select “Reset options” choose restart. -As soon as the screen goes dark hold down the volume up button until you enter WebOS Recovery mode. Note the large USB symbol that should be on the screen. If you miss it just reboot again and hold down the Volume up button right away. Once in WebOS recovery mode connect your USB cable to the PC. 5) Now you’re ready to run the WebOS Doctor app by clicking on the .jar file you downloaded in the previous step. Be sure that your tablet is fully charged and connected with the USB cable before starting this process. Running out of power or interrupting this process in anyway could brick your HP TouchPad. Please be careful and fully read the instructions before beginning. -Accept the licence agreement, read the warning message then select next to begin the install. -Be patient the process can take anywhere from 15min to 1hour to complete. A vital "root certificate" on webOS devices is due to expire on July 23, 2013. This certificate gives Touchpad users access to HPs cloud services for the App catalogue and Backing up the device. When the "root certificate" expires users will no longer have access to the App catalogue and backed up data. Furthermore HPs online WebOS support is expected to disappear altogether by the end of the year. So it’s recommended to backup your personal data and essential Touchpad software to your PC now. Getting a free App catalog update will fix the "root certificate" problem as long as you downloaded it before July,23,2013. If you are hearing about this after July,23,2013, then you will need to first set the date to June,23,2013. To do this boot into WebOS and go to settings/Date & Time, toggle off the "Network Time". Now adjust the date accordingly and download the Update, once complete comeback and Toggle on the "Network Time" button back to on. To get the update in WebOS go to Downloads/HP App Catalog. Open the app Catalog and select the categories tab at the bottom. Next click on the “new” tab at the top and Scroll down the page till you see “App Catalog Update”. Now install the update and your Touchpad support will continue to work in a post WebOS world. Note: You may get a message saying the installed failed but this is incorrect. You just need to reboot the tablet into WebOS and the patch will be installed. Note:This update requires webOS 2.1+ to be installed. Devices with older versions will need to run the WebOS Doctor first, the latest version is 3.0.5. You should see a noticeable speed improvement while using WebOS. Also a few apps to improve functionality. -Ad Blocker OR Max Block – Do not install both. This patch require you to log into Skype with the "Phone and Video Calls" app. Once there place a call to this number using the dialer type: "##5647#"
A logging window will launch, choose to "Clear Logs" first then "Change Logging Levels" and setting logging to "minimal". Once done, exit the app – your logging levels are now changed. If you have never used Preware you can watch the 2nd video about Flashing the HP Touchpads A6 Firmware to get it installed. You will also learn how to use the WebOSQuickInstall-4.5.0 software to install Preware. Both of these procedures are highly recommended and can be done as part of your post-apocalyptic WebOS Survival. Is it still recommanded / necessary to use an automated shutdown app, like automateit, to prevent the battery from total discharge with the new 4.4.4 ROMS? Is there still any risk of a battery brick, like it was reported a lot of times in the past? I am running it for half a year now without any battery problem. Reflashing the A6 every once in a while though. Thank you Roland for the update. As my tablet is running smoothly for the moment, do you think the upgrade worth it ? I'd recommend trying the Pac Rom below. Rom Details: h/w video, Audio, Camera, Bluetooth, Inverted volume controls, PAC Console (OTA updates), PAC Performance settings (overclocking, custom governors and schedulers), Increased 2D & 3D GPU clocks up to 320Mhz, Increased default CPU clock from 1188Mhz-1512Mhz, overclocks up to 1782Mhz, Great for Gamers. I recently flashed to this rom using the TPtoolbox. Everything works fine except that when I connect it to my computer it can't install the drivers. I really want to add movies on to my Touchpad..